When boating in Alabama, you are required to have a wearable PFD available for each person on board your boat. In addition, if your vessel is longer than 16 feet, you must also have at least one U.S. Coast Guard approved Type IV PFD, either a ring buoy or seat cushion. Passengers being towed behind a vessel must wear a U.S. Coast Guard Approved PFD at all times that is designed for the activity. All persons on a personal watercraft must wear a PFD while underway. Inflatable PFDs are not approved for children and should not be used for high impact sports such as water skiing or operating a personal watercraft. If you are operating a vessel within 800 feet of any hydro-electric dam or navigational lock or dam, all persons on board must be wearing a U.S. Coast Guard approved PFD (either type I, II, III or IV) in accordance with the manufacturer's instructions. All boaters or passengers under 8 years of age are required to wear a PFD while on board, unless they are below deck or in an enclosed cabin. Any substances which mentally or physically impair a person's normal functioning. If you are found guilty of Boating Under the Influence, or BUI, your boat operating privileges will be revoked for a period of 90 days, you may face fines of up to $2,100 and also face the possibility of imprisonment for up to one year. If found guilty of BUI a second time, boat operating privileges will be revoked for a period of one year, you will face fines of up to $5,100, and the possibility of imprisonment for up to one year, but not less than 5 days or a minimum of 30 days of community service. Upon a third BUI conviction, you will lose your boat operating privileges for a period of three years, face fines of up to $10,100 as well as the possibility of imprisonment for up to a maximum of one year, but not less than 60 days. 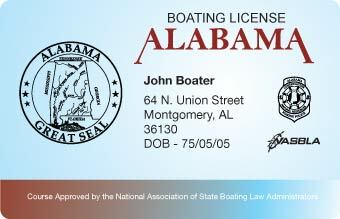 The Marine Police Division of the Department of Natural Resources regulates the boating laws in Alabama. Non-motorized, not including sailboats and vessels for rental. Owned by either federal, state, county or municipal governments within the U.S.
To register, renew or transfer ownership, you can visit your local county Judge of Probate or License Commissioner. You can also register or renew your vessel registration, only with proof of payment of sales and use tax, at the Marine Police Division office in Montgomery. An application can be downloaded and filled out prior to registering at the Probate, License Commissioner’s or Marine Police Office. Be sure to bring all documentation such as previous registration, bill of sale, and proof of payment of sales tax with the application. Notify the Alabama Marine Police Division within 15 days if you change residences, or if the vessel has been lost, stolen, destroyed, or abandoned. Your registration is valid for one year from the date of issue. The date of required renewal depends on the first letter of the vessel owner’s last name. For more information, visit the Outdoor Alabama website. 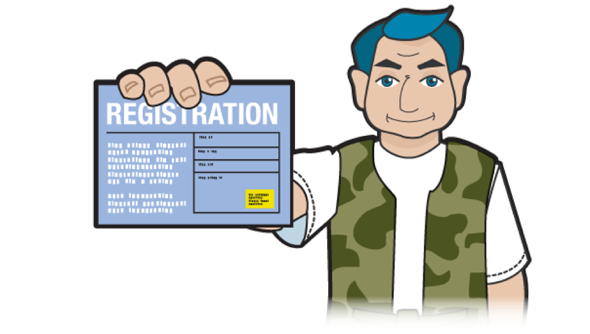 When you successfully register your vessel, you'll receive a certificate and a decal. Your permanent registration number appears on the right-hand side of the certificate preceded by the letters AL. This number must be placed on each side of the bow of the registered vessel in a position that is clearly visible at all times. Read from left to right; For example: AL 1234 BX or AL-1234-BX. The validation decal must be displayed within 6 inches before or after and in line with the registration numbers on both sides of the boat's bow. It's your responsibility to make sure your boat is properly marked and documented. It's also a good idea to always keep your papers with the boat, in a waterproof case for safe keeping. Non-native aquatic species, plants, fish and animals are invading Alabama’s waters. Hydrilla, Egeria Densa, water hyacinth and zebra mussels are nuisance species that can be accidentally transported by recreational boaters when caught in propellers, intakes or attached to hulls. These pests can multiply dramatically under the right conditions, displacing native species, clogging waterways, and impacting navigation and recreation. Once introduced, they are nearly impossible to eliminate. Before leaving a body of water, inspect your boat and dispose of any animals or aquatic plants. Drain all water from your bilge, motor and live wells. Personal watercraft are very powerful for their size and demand the same respect as any boat. Likewise, PWC operators are required to follow the same rules and regulations as any powerboat operator, including registering with the state and carrying a B-1 fire extinguisher on board. In addition, there are specific requirements for PWC operated in Alabama. The operator and all passengers of a PWC must wear a U.S. Coast Guard approved PFD at all times. Persons can only be towed behind a PWC if the watercraft is equipped with rearview mirrors on both the left and right sides. Each mirror must have a viewing area of 2.5 inches in height by 4 inches in width for a total minimum viewing area of 20 square inches. The mirrors must not be attached to the steering portion of the PWC.